Back in late 2012, Pete and Andy hadn’t yet limited themselves to one trailer pick each during a podcast episode. This was one of Andy’s picks that week. 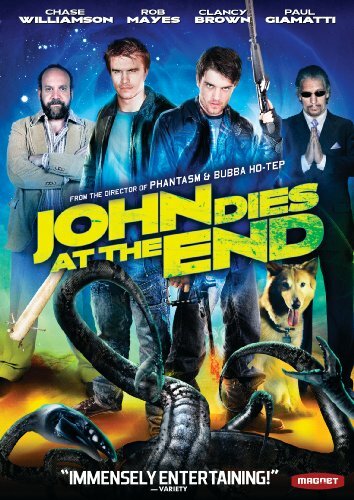 If you remember the era of late night cable movies, John Dies at the End will seem like a trip back in time to the late 80’s and early 90’s. Based on the novel by David Wong, this film is the typical fringe, supernatural horror we have come to expect from director Don Coscarelli. It’s a late night midnight snack. It’s not substantial, it’s not for everyone, but it is enjoyable if you accept it for the empty calories. What makes this film enjoyable is the fact that the characters readily accept every odd thing that comes their way – shuffling meat monsters, metamorphosing moustaches, and an invasion from an alternate universe. Since there is little time spent building the world or explaining the rules, we must either accept the reality we are presented with, just as David and John do, or reject it, and as a result, the film itself. I’ve seen this movie twice, and have enjoyed it each time. The story is non-linear, there is minimal explanation of many of the events, but if you let it, it will scoop you up in its tentacles and pull you along for an enjoyable ride.